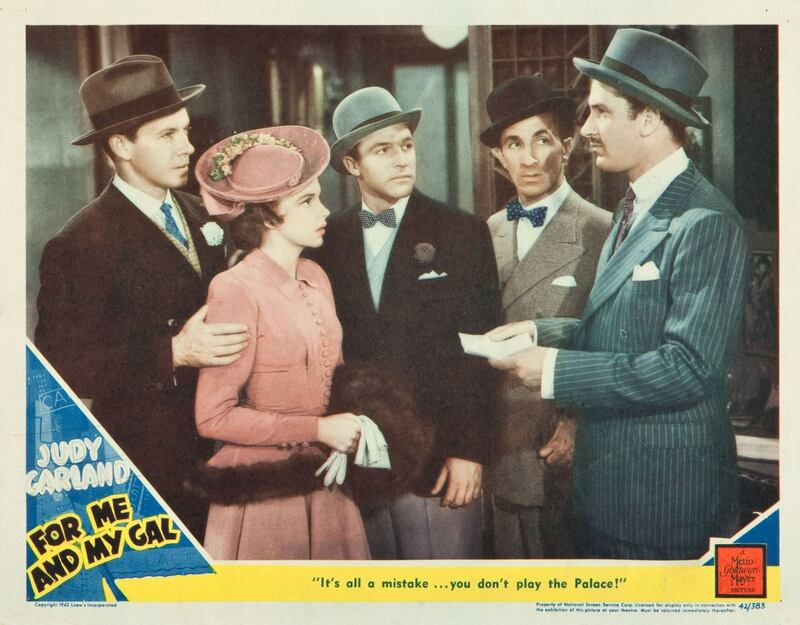 May 6, 1942: For Me And My Gal filming consisted of scenes on the “Interior Palace Backstage” set with co-stars Gene Kelly, George Murphy, Keenan Wynn, and Ben Blue. May 6, 1957: Judy’s third album for Capitol Records, “Alone,” was released. To this day is a fan favorite and one of her very best studio albums for the label. Some consider it her best. Judy recorded the songs for the album in February and March 1957. Orchestrated and conducted by Gordon Jenkins, “Alone” was Judy’s first and best “conceptual” album. All of the songs reflect the album’s title of being “alone.” as does the artwork. This album is quite a departure for Judy, who shows her versatility as a vocalist by performing very bluesy and jazz-infused numbers. If you ever want to show people that Judy Garland sang more than just “show tunes”, this is the album to play. The 1989 premiere CD release includes a bonus track of “Then You’ve Never Been Blue” which recorded on March 6, 1957, but not included on the album until then. The CD quickly went out of print and became a hot collector’s item until the 2002 reissue coupled with “Judy In Love”. 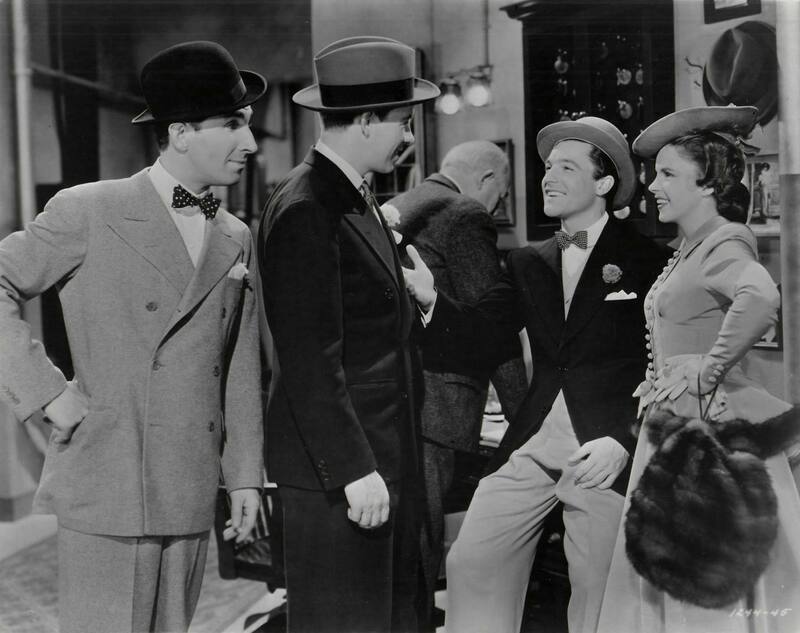 MORE DETAILS at The Judy Garland Online Discography’s “Alone” pages here. May 6, 1961: Judy’s concert tour took her to the Civic Opera House in Chicago. After the show, there was a dinner party at midnight given for Judy at the Cafe De Paris. Judy and More Judy at Opera House – What Garland Fan Wants More? AS JUDY GARLAND is to one kind of audience what Maria Callas is to another, it seemed a plausible idea to track her to a Callas stamping ground Saturday night – the Civic Opera house, which she packed even to the orchestra pit – and find out why. No problem. They both get people excited. Not necessarily the same people. But almost anyone will admit that Judy is a darling, and that when she and her microphone ride the high brass to belt out a song, that song has been belted. She is smaller than you might think, and totally unpretentious. When she walks out in a short black dress with a jeweled turquoise jacked she looks like a child. 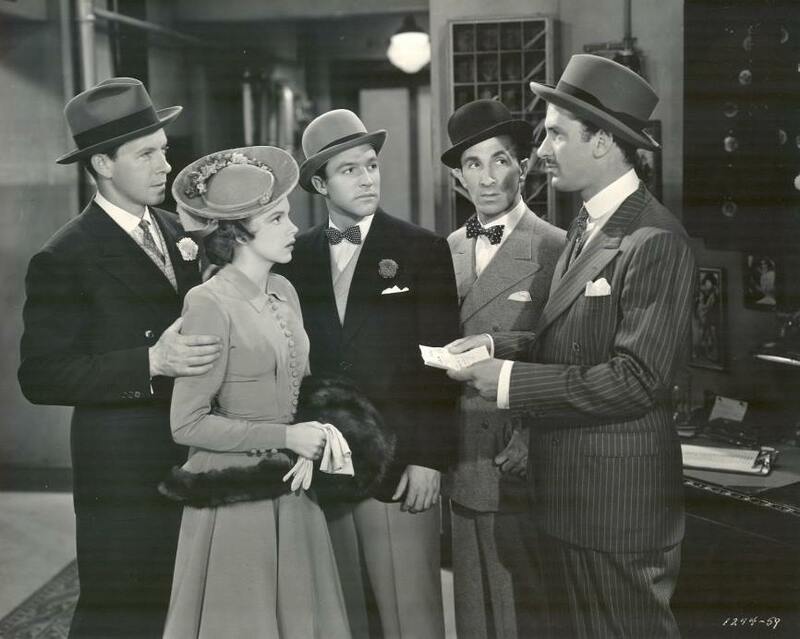 But a child born backstage, probably at the Palace, cradled in a theater trunk, and carried to the wings to watch Sophie Tucker, Jack Benny and Harry Richman. Completely and casually at home, she is a bit like a friendly little hausfrau, mopping her dripping face, pushing back her hair, gossiping – until she sings. Then she is a changeling. An all out extrovert in a blaze of the blare who can remind you of Ethel Merman, tho Merman used to blast the walls down with a mike. An introvert when the lights dim, a spot hits the round face and gives it cheek bones, and a curious wobble comes into her low voice that can make you remember how Libby Holman’s chin quivered with “Moanin’ Low.” In still another shift of gears, her voice is all wobble, so flat that it can make you want to hurry up the aisle. Oddly, this seems to put the true Garland audience, which has shouted and stood up and roared its delight, into a kind of trance. It sends me too, but home, and without rancor. Not everyone likes to hear Callas sing E above high C.
The girls broke out even, orchestra-wise. Maria had more players, but Judy’s 30 or so under Mort Lindsey’s direction made more noise. The more noise, the better Judy sings. 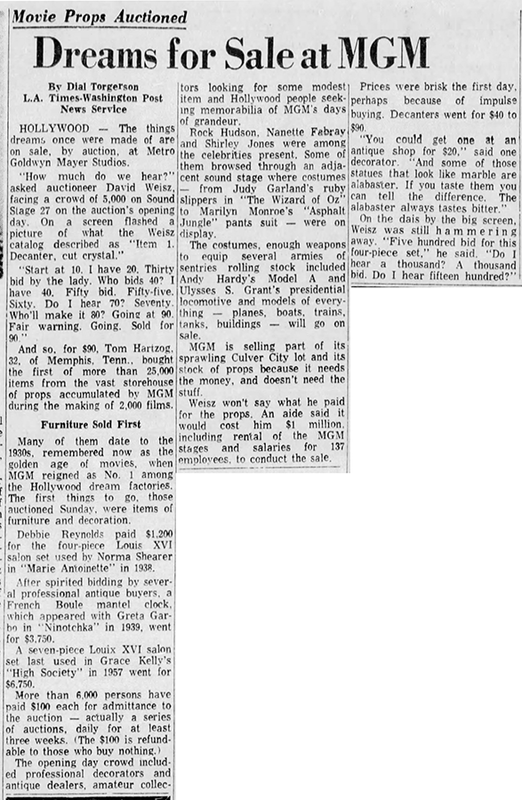 May 6, 1970: The now legendary MGM auction was making headlines. 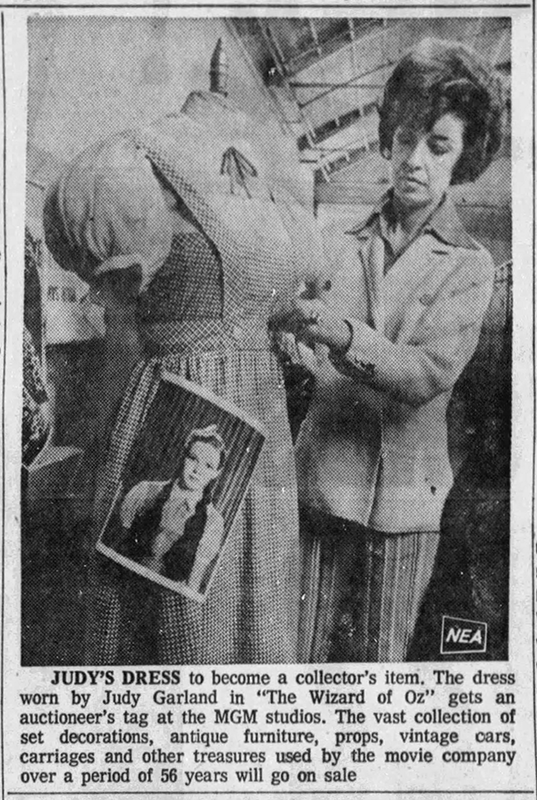 The auction opened on May 3rd with the first day of the sale devoted to “Antiques and Furniture.” The entire event lasted for 18 days, each day split into categories that included three days of “Antiques and Furniture”; two days of the larger props such as the “Cotton Blossom” paddle wheel steamer from Showboat (1951) and various wagons, tanks, buses, statuary, more furniture and props and even portable dressing rooms; a day devoted to weaponry ranging from Roman swords and armor to more recentl rifles and hand guns; a day devoted to “Nursery” including trees, bushes, flowers and other plants; and of course the big day on May 17th which was devoted to “Star Wardrobe” and included what was then assumed to be the only pair of Ruby Slippers that Judy wore in The Wizard of Oz (1939). Click on the image of the article above right to view and read the larger version.